New data using GeoStreamer® gives extraordinary imaging of sub-salt and deeper events in the Levantine Basin in the eastern Mediterranean. Location of the 2D seismic lines offshore Cyprus, where dual-sensor and vintage hydrophone data have been compared. © PGS The recent giant sub-salt gas discoveries (7Tcf) offshore Israel in the Levantine Basin are bringing the eastern Mediterranean into the limelight. High quality lower Miocene sandstone reservoirs have been identified in the Tamar and Dalit wells in the underexplored Levantine Basin. 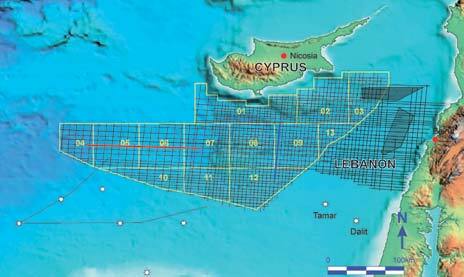 PGS, in cooperation with the Ministry of Commerce, Industry and Tourism of the Republic of Cyprus, have a database of non-exclusive 2D and 3D seismic covering the Cyprus offshore. Understanding of this area has been substantially improved by new seismic data acquired in 2008 and 2009, providing more than 12,000 line km of new data to supplement the existing 2D grid. The PGS data was acquired using GeoStreamer®, consisting of hydrophones and velocity sensors and the processed data gives extraordinary imaging, in particular of sub-salt and deeper events, which will materially improve the interpretation and understanding of the petroleum potential in this deep-water area. The data also forms the basis for the Republic of Cyprus second offshore license round to be launched later in 2009. The regional 2D data set also extends into the Levantine Basin offshore Lebanon. About 5,500 line kilometres have been acquired and will be available together with the 3D seismic. Many attractive sub-salt leads with associated direct hydrocarbon indicators have been identified and reveal an active petroleum system offshore Lebanon. The Lebanese Ministry of Energy and Water is currently planning for their first license round in the near future. The new dual-sensor streamer 2D data has been compared to legacy conventional streamer data offshore Cyprus to analyze the differences and quantify the improvements in seismic resolution. A comparison of PSTM stacks between the vintage hydrophone data and the up-going pressure field (P-up) showed in general a higher signal-to-noise ratio and better resolution of the P-up image. Spectral analyses quantified the amplitude versus frequency level and showed a significant increase of both low and high frequencies. The low frequency enhancement was particularly significant deeper in the sections with spectacular penetration below the Messinian Salt layer. A regional 2D grid was acquired in 2006 using a conventional hydrophone streamer. In 2008/9 a 2D infill program using the dual-sensor streamer was used to improve the seismic coverage and optimize the data quality in the area. This dual-sensor cable consists of both hydrophones and velocity sensors, allowing us to record the pressure field and the vertical component of the particle velocity field simultaneously. By combining the two measurements, the up- and down-going wavefields can be separated, enabling the receiver ghost to be removed. Parts of lines from the 2006 survey were reshot using the dual-sensor cable for comparison purposes. The key objective was to penetrate the evaporites and maximize the seismic resolution of the layers below. Seismic modelling and survey planning were accordingly done to optimize the acquisition parameters. The source volume was increased from 4,720 cu. in., used in 2006, to 6,180cu. in. in the new survey and the streamer towing depth was increased from 10m to 25m. The other parameters were the same as in 2006, including 8m source depth, 8,100m streamer length, 12.5m group length and 25m shot point interval. The map illustrates the location of the comparison tests offshore Cyprus. The test lines were acquired in the same direction and repeated the same shot point positions as the 2006 lines. The processing steps included SRME, high resolution Radon demultiple, multiple diffraction attenuation, f-x deconvolution, Q-compensation, time-variant filtering, Kirchhoff PSTM and NMO stack. The up-going pressure wavefield (P-up) derived from the dual-sensor data was extrapolated to the 2006 survey streamer depth. Conventional vintage PSTM stack (top) and P-up PSTM stack (bottom) of the E-W 2D line. The Kirchhoff PSTM stacks of the vintage conventional hydrophone data versus the P-up data of the red E-W line is shown in the figure on page 51. The P-up data appears to have higher signal-to-noise ratio in general, as well as better continuity and resolution. Focusing on the seismic events below the Messinian Salt we observe that it is possible to interpret the deep rotated fault blocks along the section on the P-up data, which were not clearly visible on the vintage data. Comparing the blue N-S lines (page 53) one observes a higher signal-to-noise ratio in general. The horst and the Base Messinian Salt reflector in particular have become better defined. The low frequency content has dramatically increased on the P-up data and the shallow part of the section has improved, with additional high frequency events visible on the P-up data. The towing depth of the dual-sensor cable controls the amplitude spectrum: the 25m tow generates a receiver ghost at 30Hz, but also multiplies the energy at 15Hz by a factor of 2. Since the peaks and notches in the amplitude spectra for the pressure field are exactly opposite to the peaks and notches for the particle velocity field, the receiver notches in the amplitude spectrum are removed after wavefield separation (Carlson et al., 2007). By towing as deeply as possible the weather and operation noise is minimized, which optimizes the recorded low frequencies. Furthermore, the comparison shows that the GeoStreamer® also provides the high frequencies, which would not be obtained by towing at conventional hydrophone cable depth. Conventional vintage PSTM stack (top) and P-up PSTM stack (below) of the N-S 2D line. Several leads have been identified in offshore Cyprus and Lebanon (Semb, 2009); In the Levantine Basin four way dip closure structures are identified as well as attractive onlap pinch outs. 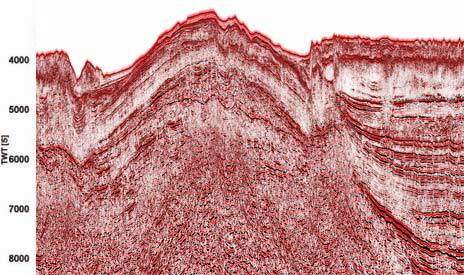 To the west of offshore Cyprus in the Herodotus Basin several tilted fault blocks are imaged in the pre Messinian package. The Eratosthenes complex has been identified as an enormous four way closure structure located about 100 km south of Cyprus mainland. This structure is one of the largest in the Mediterranean and based on the GeoStreamer® data more of the elements of the structure are revealed and leaves this structure as one of the most interesting hydrocarbon plays in offshore Cyprus (see illustration on this page). East – West GeoStreamer® line over the Eratosthenes structure. A comparison between conventional 2D seismic streamer data and dual-sensor 2D streamer data offshore Cyprus shows that the up-going pressure wavefield (P-up) gives a significant imaging uplift when comparing Kirchhoff PSTM stacked sections. The dual-sensor data enables the receiver ghost to be removed because the up- and down-going wavefields can be separated, therefore the frequency content and the resolution have been enhanced in the P-up image for all frequencies. This improved data quality allows for a better structural interpretation, in particular at the Base Messinian Salt and in the deeper faulted blocks. The authors would like to thank Solon Kassinis of the Ministry of Commerce, Industry and Tourism of the Republic of Cyprus, and PGS Geophysical for permission to publish this paper. Additionally we would like to acknowledge the contribution from PGS Data Processing UK. Carlson, D., Long, A., Söllner, W., Tabti, H., Tenghamn, R. and Lunde, N., 2007, Increased resolution and penetration from a towed dual-sensor streamer: First Break, 25, no. 12. 71-77. Semb, P. H., 2009, Possible seismic hydrocarbon indicators in offshore Cyprus and Lebanon: GeoArabia, 14, no. 2. 49-66. A history of research in tight mudstone rocks, a long record of research in South America and a significant ArcGIS database of wells, seismic and samples across a number of basins on the continent facilitated research into South American shales potential.